It seems strange to think that until the launch of this GLC model, Mercedes had never offered a proper compact SUV. Or at least it'd never offered one in the UK. On the Continent, the Stuttgart brand has always taken on cars like Audi's Q5 and BMW's X3 with its GLK-Class model, but this was never engineered to be produced in right hand drive. Big mistake. 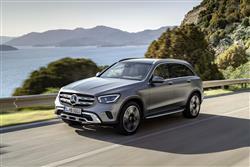 It's taken a long time for the Three-Pointed Star to correct that error, but now that it has, this GLC model can take its place in the company's growing SUV line-up. It gets two frugal diesel engines and, unlike the smaller A-Class-based GLA Crossover, is mainly offered with four wheel drive. In other words, it's a proper SUV model. Mercedes has worked on making the engine range more powerful and more fuel efficient than before and the mainstream part of the line-up is based around four-cylinder units. 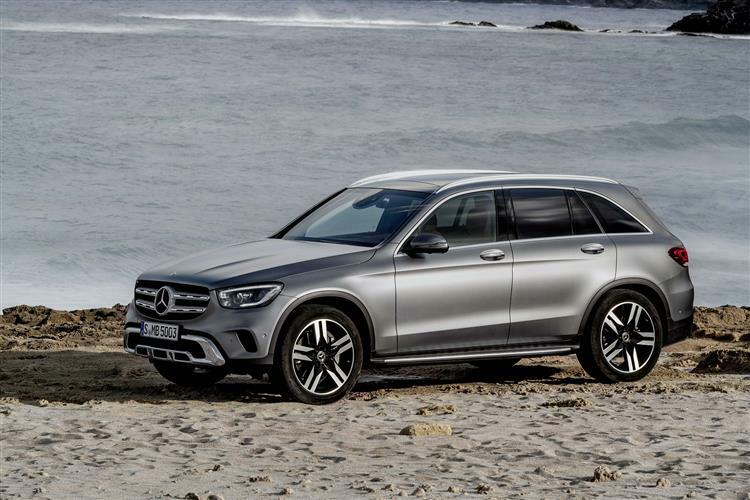 A 2.0-litre turbocharged petrol unit features in the 194hp GLC 200 and the 258hp GLC 300, while the two main diesel options are the 194hp GLC 220d and the 245hp GLC 300d, which get the brand's latest 2.0-litre diesel, replacing the previous 2.1-litre unit. Every model is equipped with all-wheel drive. 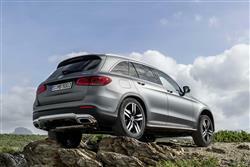 The petrol versions now use the Mercedes' EQ 48-volt mild hybrid system. Here, there's an integrated starter/alternator unit that can recover up to 10kW of energy when decelerating, which can then be deployed below 2,500prm to reduce the effort required of the combustion engine. Mercedes has worked on the suspension too, introducing an updated version of its 'Dynamic Body Control' adaptive damping system which can adjust the rate of control to each of the four wheels. As before, there's also the option of 'AIR BODY CONTROL' air suspension, promising a cosseting ride when you want luxury or flat, sportscar-like handling when you're in a hurry. With an optional 'Off Road Engineering Package', you can even manually adjust ride heights through the infotainment system. For highway use, there are now more semi-autonomous driving assistance systems. Active Distance Assist DISTRONIC and Active Steer Assist provide even more support to help the driver to steer and to keep a safe distance. 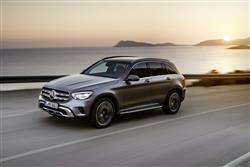 First impressions are that the GLC is most definitely related to the C-Class compact executive model it's based upon. There's the same long nose and gently sloping roofline we've come to recognise, along with similar contouring down the flanks. With this revised model, subtle changes have been made to the grille, the lights and the bumpers. At the front, the re-styled headlamps feature full-LED tech, while the daytime running lights feature an extended 'C' shape. The smarter bumper features reshaped vents to either side of the main intake. At the sides, chrome elements span the length of the lower sills, and smarter alloy wheel designs range from 17 to 20 inches. Around the back, the tail lights - also featuring LED tech - get a smarter lighting signature, and sit above a reprofiled bumper. Inside, the GLC now gets the latest version of Mercedes's MBUX infotainment system. This means that the centre-dash display, which has grown from 8.4 inches to 10.25 inches, is now touch sensitive, and can respond to both gesture and more detailed voice commands. A 12.3-inch digital driver's instrument binnacle display is now offered in place of the previous car's analogue gauges, and its three sections can be customised to display different information. These menus can be accessed through the updated steering wheel, which features a mix of physical and touch-sensitive controls first seen on the E-Class. The cabin also features a couple of new material options, including two new wood finishes for the dashboard. Boot space is up to 580-litres seats up - nearly 100-litres more than the C-Class - while seats down, this becomes a cavernous 1600-litres. Prices for the mainstream four cylinder models sit mainly in the £38,000 to £50,000 bracket and as a GLC buyer, your first choice will probably be to decide if you need the extra power the pokier 300d model offers over the base 220d variant. As there's very little economy penalty in choosing the faster car and not much of a price difference, the 300d would be our pick. 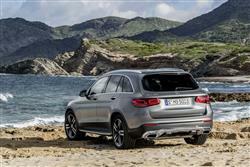 Overall, expect this Mercedes to cost a slight premium over its Audi Q5 and BMW X3 direct rivals. All GLCs receive a 9-speed automatic gearbox, four wheel drive, the 'COMAND' infotainment system, 'DYNAMIC SELECT' handling control with adjustable dampers, plus all the usual niceties you'd expect from a Mercedes of this price. Safety-wise, there's a full rosta of electronic shields that scan the road ahead and prevent you from having an accident. Things like the 'COLLISON PREVENTION PLUS' system, plus the 'Crosswind Assist' set-up and the 'ATTENTION ASSIST' system. Optional is the 'DISTRONIC PLUS' radar cruise control system - with 'STEERING ASSIST' to keep you in lane and a 'Stop & Go' feature that'll slow the car automatically and start it off again if you come across a motorway tailback. All GLCs come with a 3 year warranty and should prove to hold onto their value well. That's provided you don't go mad on the options list of course. There's also an ASSYST dashboard service indicator that monitors engine use and tells you exactly when a garage visit is due. It's also worth mentioning that the included 'Mercedes me' connect services package includes remote self-diagnostic capability, enabling your GLC to monitor wear and tear items and alert your local dealer to let you know if something needs seeing to. You can also insure your car through Mercedes, though most company drivers will have this included in their lease cost. Image is everything when it comes to premium mid-sized SUVs and on that basis, this improved GLC is a very desirable package. 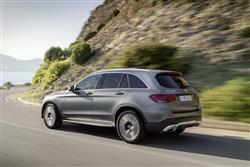 In terms of styling, technology and efficiency, it borrows hugely from other Mercedes models - to very good effect. Plus options like air suspension offer the kind of luxury that used to be limited to much larger luxury SUVs, enabling this car to cross ravines one minute and carve through a set of bends at speed the next. Some may feel that there are still more dynamic choices to make in this segment: the trendier-looking Range Rover Evoque for example. Or the more sharply-handling BMW X3. As an all-rounder though, combining many of the qualities you'll find in both those cars, the GLC is a tempting package.